Maryland's Democratic senators are demanding information about the Social Security Administration's implementation of President Trump’s recent workforce executive orders, which they said went far beyond the mandate set out by the Trump administration. Sens. Chris Van Hollen and Ben Cardin sent letters to SSA Acting Commissioner Nancy Berryhill and Associate Commissioner Ralph Patinella, and to Social Security Commissioner Nominee Andrew Saul and Deputy Commissioner Nominee David Black, asking for information about the agency’s actions taken to implement the controversial executive orders. 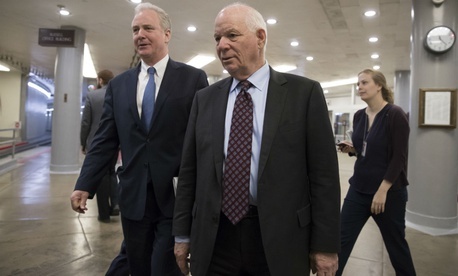 The senators also sought reassurances from the nominees that if confirmed, the agency will honor existing collective bargaining agreements with federal employee unions. In May, the Trump administration enacted three executive orders governing the federal workforce: the first shortens the firing process for feds and limits appeals; the second seeks to streamline the collective bargaining process; and the third aims to reduce unions’ ability to use official time and orders agencies to stop providing free or discounted office space for union representational work. The orders are subject to a legal challenge, and an opinion from a federal judge in the case is expected in the coming days. Since then, the agency has severely restricted the use of official time, as well as denied union representatives' requests to take leave to do representational work. Officials also have begun efforts to evict union officials from agency office space, and forced a new collective bargaining agreement onto the Association of Administrative Law Judges, despite the fact that the association had an existing agreement that does not expire until this fall. In their letter to Berryhill and Patinella, Cardin and Van Hollen accused them of exceeding “even the dubious authority provided by these orders.” They noted that the executive orders make clear that agencies should not overrule or void bargaining agreements that have not yet expired. The senators also asked two key SSA nominees to provide “assurances” that they will not continue these practices if confirmed. They demanded that once in their positions, that they instruct the agency to rescind unilateral changes to its existing collective bargaining agreements and to negotiate “in good faith” for new bargaining agreements. They also asked the agency officials to do “everything in your power” to reach agreement without going to the Federal Service Impasses Panel. In an email to Government Executive, SSA spokeswoman Nicole Tiggemann said the agency had received the senators' letter and that the agency has given unions the "opportunity" to bargain over the executive order implementation. Union officials have denied that SSA has followed mid-term bargaining protocols. "As required by Federal Service Labor Management Relations Statute and our collective bargaining agreements, Social Security provided each union with appropriate notice and the opportunity to bargain the impact and implementation of the Executive Orders," Tiggemann said. "In adhering to the directives in the EOs, Social Security is working closely with the unions to ensure an orderly implementation supporting the vital missions we perform for the American public."